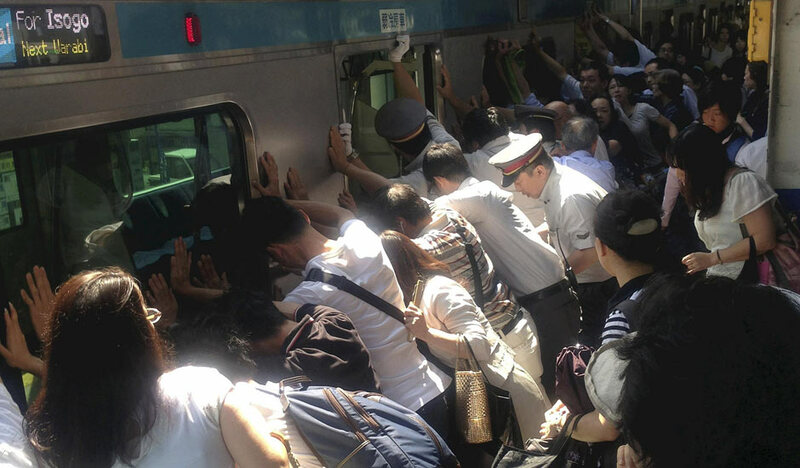 Today in Japan, a group of commuters pushed a train onto a tilt to free a woman who slipped down the side and got trapped. The unidentified woman, in her 30s, slipped into the gap at Minami-Urawa station, north of Tokyo, on Monday morning, as she got off the train. Station officials asked commuters to help tilt the carriage so that the trapped woman could be freed. The woman was pulled from the gap and had no major injuries. A photographer from Japan’s Yomiuri newspaper captured the image of the passengers in action, who applauded when the woman was freed. The train carriage was able to tilt because of its suspension system, the paper reported. The train was sent on its way after a delay of just eight minutes, the paper said.